Giacomo Carissimi was born in 1605. The 400th anniversary of his birth has been celebrated with a flood of recordings. Most of them are devoted to his oratorios, the genre for which he was most famous. The present disc sheds light on some of his other sacred music, which until now has been largely neglected: motets and sacred concertos. It has to be added, though, that there is no clear distinction between these pieces and the oratorios. 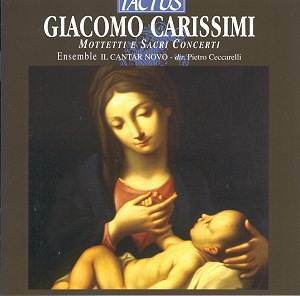 Some of Carissimi's oratorios were also referred to as motets, and some sacred concertos on this disc are written in the form of a dialogue, just like the oratorios. In 1629 Carissimi became �maestro di cappella� of the Jesuit Collegio Germanico in Rome, and his oratorios were performed in the Collegio. His motets were written for the daily services at the church of the Collegio, the S. Apollinare. Most of Carissimi's compositions were kept in the Collegio, and when it was looted in 1773 his musical heritage was also destroyed. Fortunately he had many pupils from all over Europe who held his music in such high esteem that they owned copies which have been found in many different places. Thanks to them we can still listen to his music. The first five pieces on this disc are from a manuscript preserved in Bologna, the others are from three different collections which were published in 1643, 1655 and 1675. In particular the last three works come close to the genre of the oratorio: 'Domine, quis habitabit', for instance, is a dialogue between Jesus and two souls. A number of pieces contain contrasting sections for soli and tutti. It isn't very difficult to understand why Carissimi had such a huge reputation during his life and beyond. The text is painstakingly translated into music, and these works demonstrate that Carissimi was a master of musical rhetoric and 'affetti'. These are explained at length in the programme notes. Unfortunately this is lost on those who don't understand Latin as no English translation of the lyrics is given. That is not the only problem. Everyone knows that recordings as they are released are the result of a lot of cutting and pasting. But the listener shouldn't hear that. But at several occasions the cuts are clearly audible. The way 'Ardens est cor meum' (track 9) ends is a striking example of this unprofessional neglect. There is also far too little time between tracks. The voices are generally good, although I find the slight tremolo of Cristina Curti irritating. Francesca Cassarini, on the other hand, has a very beautiful voice, which is crystal clear and blends far better with the other singers than Curti's. But the interpretation hasn't really satisfied me. First of all, most voices - in particular the tenor and bass - are not strong enough, and there are some intonation problems as well. Secondly, the rhetorical features of these works as described in the booklet are not fully exploited in the performance. There is a lack of dynamic contrast in most pieces and the 'affetti' are much stronger than one would guess on the basis of these interpretations. Furthermore there should be more variety in the ornamentation. On the whole there is just too little real passion and excitement in this recording. I do not know of any other recording of this repertoire so I must I recommend this disc to those curious to know what else Carissimi wrote apart from oratorios. That said, these pieces deserve a much better recording than Il Cantar Novo is offering here.